Unaware of the flimsy scientific scaffolding upon which their dietary guidelines rest, Americans have dutifully attempted to follow them. Since the 1970s, we have successfully increased our fruits and vegetables by 17 percent, our grains by 29 percent, and reduced the amount of fat we eat from 43 percent to 33 percent of calories or less. The share of those fats that are saturated has also declined, according to the government’s own data. (In these years, Americans also began exercising more.) Cutting back on fat has clearly meant eating more carbohydrates such as grains, rice, pasta, and fruit. A breakfast without eggs and bacon, for instance, is usually one of cereal or oatmeal; low-fat yogurt, a common breakfast choice, is higher in carbohydrates than the whole-fat version, because removing fat from foods nearly always requires adding carbohydrate-based “fat replacers” to make up for lost texture. Giving up animal fats has also meant shifting over to vegetable oils, and over the past century the share of these oils has grown from zero to almost 8 percent of all calories consumed by Americans, by far the biggest change in our eating patterns during that time. In this period, the health of America has become strikingly worse. When the low-fat, low-cholesterol diet was first officially recommended to the public by the American Heart Association (AHA) in 1961, roughly one in seven adult Americans was obese. Forty years later, that number was one in three. (It’s heartbreaking to realize that the federal government’s “Healthy People” goal for 2010, a project begun in the mid-1990s, for instance, was simply to return the public back to levels of obesity seen in 1960, and even that goal was unreachable.) During these decades, we’ve also seen rates of diabetes rise drastically from less than 1 percent of the adult population to more than 11 percent, while heart disease remains the leading cause of death for both men and women. In all, it’s a tragic picture for a nation that has, according to the government, faithfully been following all the official dietary guidelines for so many years. If we’ve been so good, we might fairly ask, why is our health report card so bad? A line of argument in favor of eating these whole-fat animal foods has sprung up among cookbook authors and “foodies,” who can’t believe that all the things their grandparents ate could really be so bad for them. There are also the Paleo eaters, who swap information on Internet blogs and survive on little else but red meat. Many of these recent animal foods devotees have been inspired by the doctor whose name is most closely associated with the high-fat diet: Robert C. Atkins. As we will see, his ideas have endured to a surprising extent and have been the subject of a great deal of scholarship and scientific research in recent years. But newspapers still carry alarming headlines about how red meat causes cancer and heart disease, and most nutrition experts will tell you that saturated fat is absolutely to be avoided. Hardly anyone advises otherwise. Nina Teicholz is an investigative science journalist and author as well as an advocate for evidence-based nutrition policy. Her work has appeared in The New York Times, The Wall Street Journal, The Independent, The Atlantic, and The New Yorker, among other places. She grew up in Berkeley, California, and now lives in New York. "Teicholz may be the Rachel Carson of the nutrition movement..."
"Nina Teicholz reveals the disturbing underpinnings of the profoundly misguided dietary recommendations that have permeated modern society, culminating in our overall health decline. But The Big Fat Surprise is refreshingly empowering. This wonderfully researched text provides the reader with total validation for welcoming healthful fats back to the table, paving the way for weight loss, health and longevity." "A page-turner story of science gone wrong: what Gary Taubes did in Good Calories, Bad Calories for debunking the connection between fat consumption and obesity, Nina Teicholz now does in Big Fat Surprise for the purported connection between fat and heart disease. Misstep by misstep, blunder by blunder, Ms. Teicholz recounts the statistical cherry-picking, political finagling, and pseudoscientific bullying that brought us to yet another of the biggest mistakes in health and nutrition, the low-fat and low-saturated fat myth for heart health." "At last the whole truth about the luscious foods our bodies really need!" "This meticulously researched book thoroughly dismantles the current dietary dogma that fat--particularly saturated fat--is bad for us. Teicholz brings to life the key personalities in the field and uncovers how nutritional science has gotten it so wrong. There aren't enough superlatives to describe this journalistic tour de force. I read it twice: once for the information and again just for the writing." "The Big Fat Surprise delivers on its title, exposing the shocking news that much of what “everybody knows” about a healthy diet is in fact all wrong. This book documents how misunderstanding, misconduct and bad science caused generations to be misled about nutrition. Anyone interested in either food or health will want to read to this book." "Read Teicholz's excellent book and tell me you aren't convinced she's right." "Teicholz has done a remarkable job in analysing. . . [the] weakscience, strong personalities, vested interests, and political expediency." "Thisis the most provocative and assumption-shredding food book I've read inyears.... All in all, a must read." "It's so important for everyone to read this book." 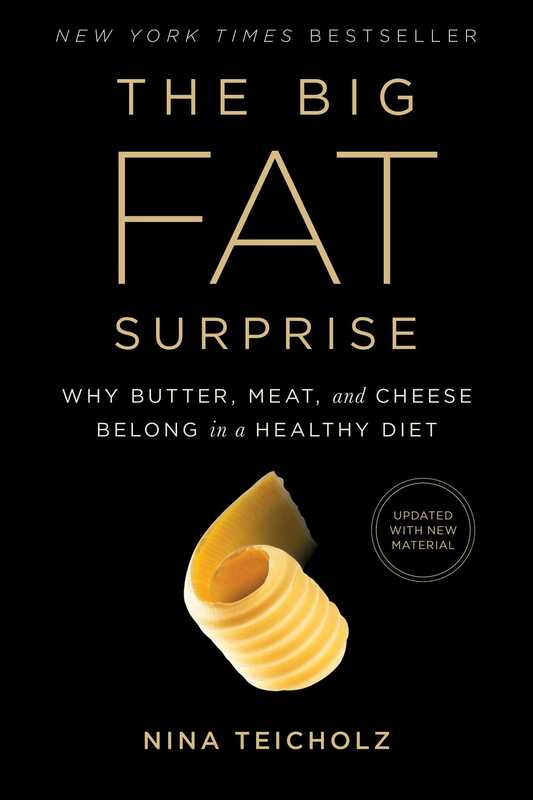 "Nina Teicholz's The Big Fat Surprise is essential reading on the saturated fat debate . . . Blew my mind." "The Big Fat Surprise is a gripping narrative. . . Teicholz reminds us to critically question research and, more importantly, challenge unjustified extrapolation. . . Researchers, clinicians, and health policy advisors should read this provocative book." "This book should be read by every nutritional science professional...All scientists should read it as an example of how limited science can become federal policy....well-research and clearly written....Teicholz compiled a historical treatise on how scientific belief (vs. evidence), nongovernment organizations, food manufacturers, government agencies, and moneyed interests promised more than they could deliver and, in the process, quite possibly contributed to the current world-wide obesity epidemic."